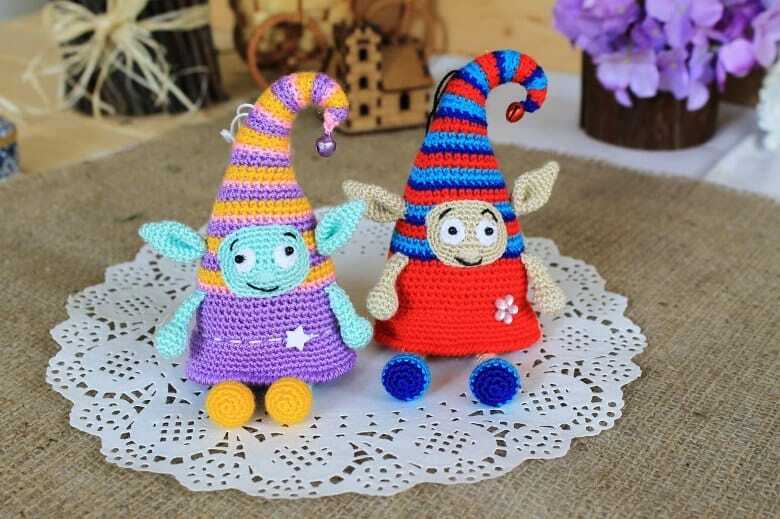 This free amigurumi pattern will teach you how to crochet a cute fairy elf doll. The pattern contains photos that explain all difficult details. 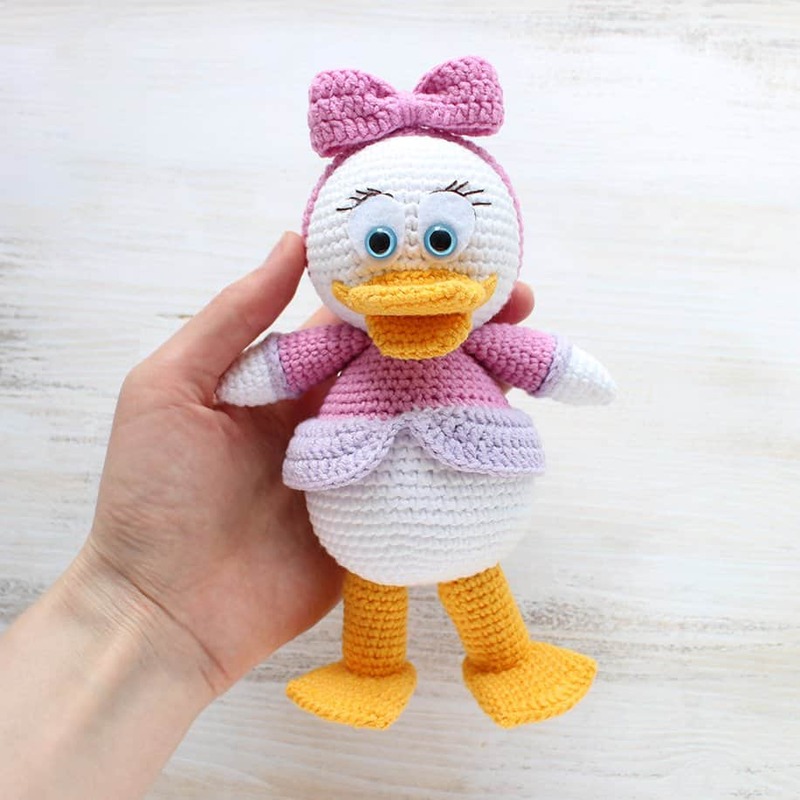 But if you have some questions on this tutorial you can always write them in comments. Make a magic ring, leaving a long tail (take it outside through the hole). We’ll use this tail to cirl the cap. Alternate the colors of stripes as you wish. The main color begins from the Round 42. 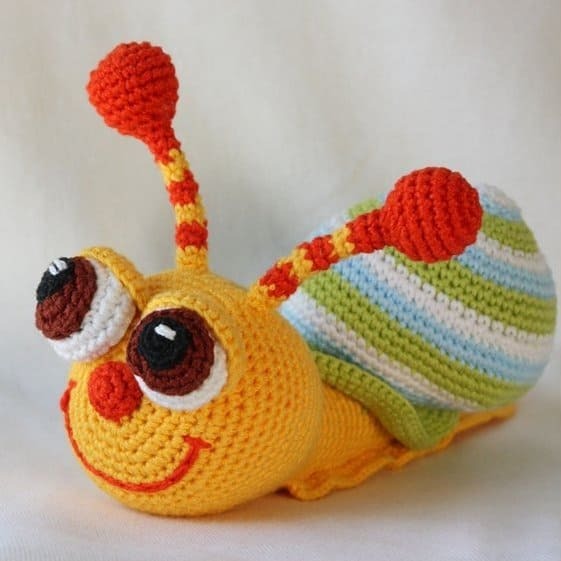 It means that Rounds 1-41 are crocheted in stripes, and then crochet in main color. 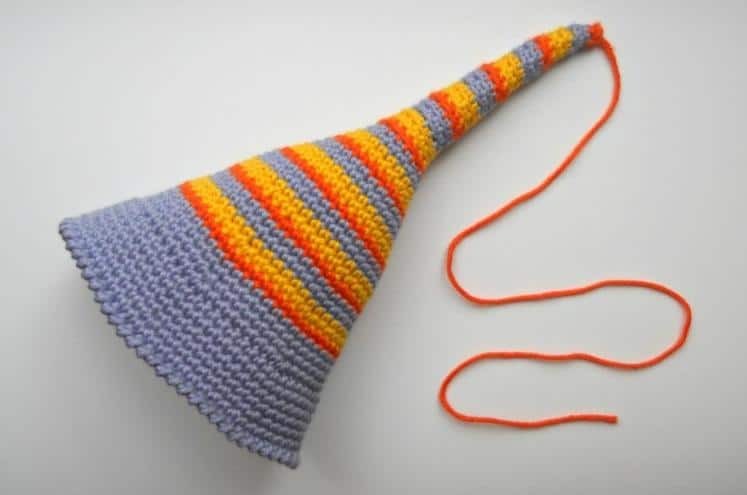 If you want to have stripes as in the picture, then crochet in the following way: Rnd 1 – orange, Rnd 2-3 – lilac (this color is the main one), Rnd 4-5 – yellow. Then the pattern is repeated. In this case you’ll have the tip of the cap (Rnd 41) orange, and Rnd 42 will be lilac. The cap is finished, crochet in one colour. Rnd 49: sc in the next 60 st IN FRONT LOOPS only. The belt will be here. Rnd 55: crochet 66 shrimp stitches around (shrimp stitch is also known as crab stitch or reverse single crochet). Fasten off, cut the yarn and weave in the end. 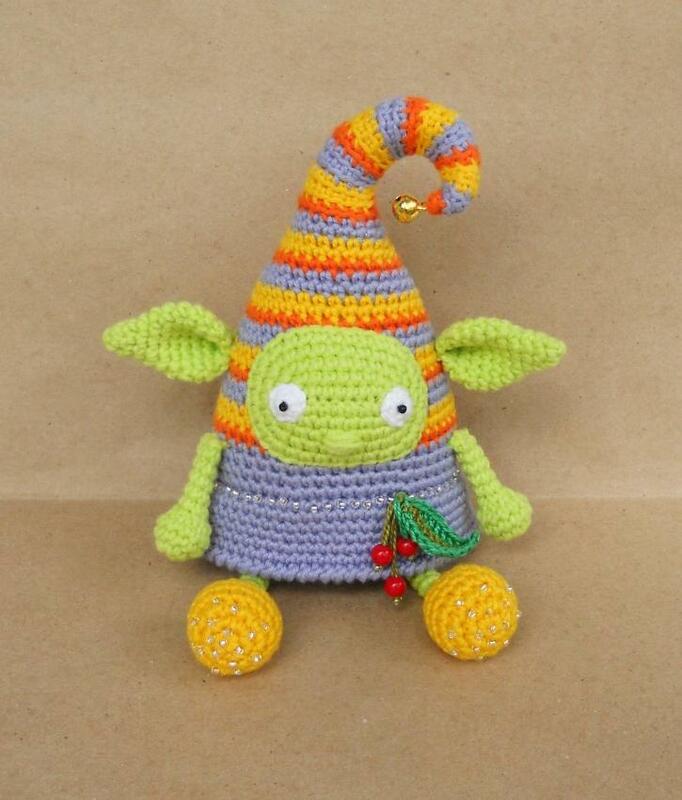 Make sure that your elf is stuffed enough, because the opening will be closed soon. Cut the yarn leaving a long tail. Insert it in the needle and sew the opening straight. 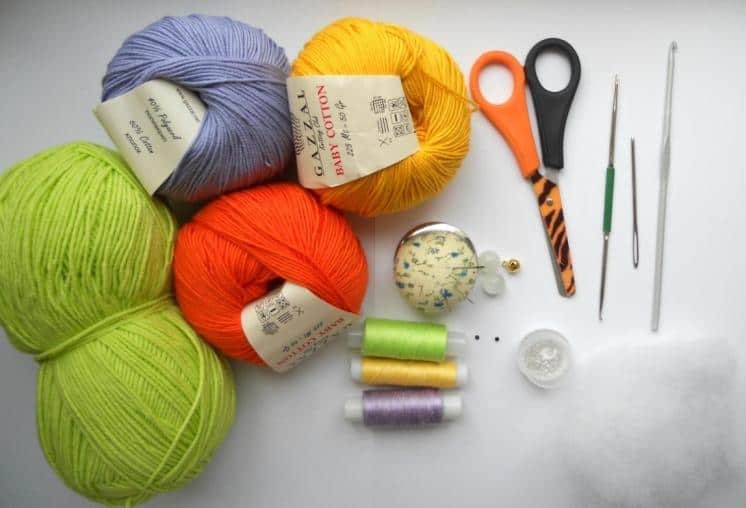 Start crocheting with the color you choose. Stuff only the bottom part of the legs. It’s better to put a heavy bead with stuffing there for the leg to be a bit heavier. Rnd 9: (dec) repeat 6 times. Fold in half, crochet sc through both layers of the last round. Leave a tail for sewing. 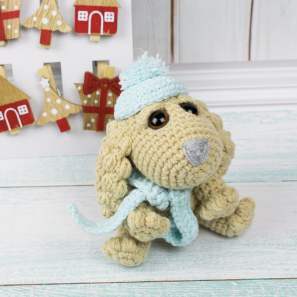 The second leg is crocheted in the same way. 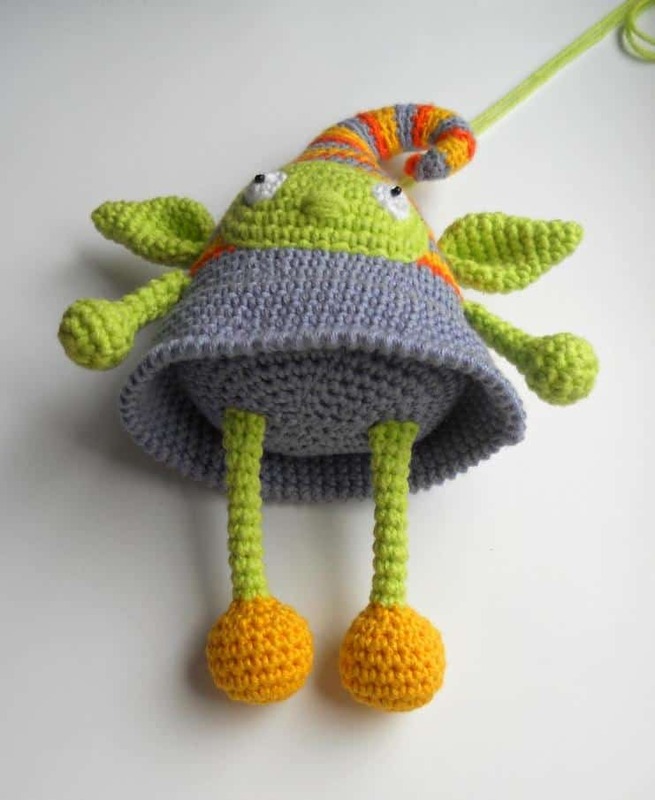 Crochet arms with light-green yarn. Stuff only the upper part of the arms. Rnd 5: (dec) repeat 6 times. Fold in half, crochet sc through both layers of the last round. Leave a tail for sewing. 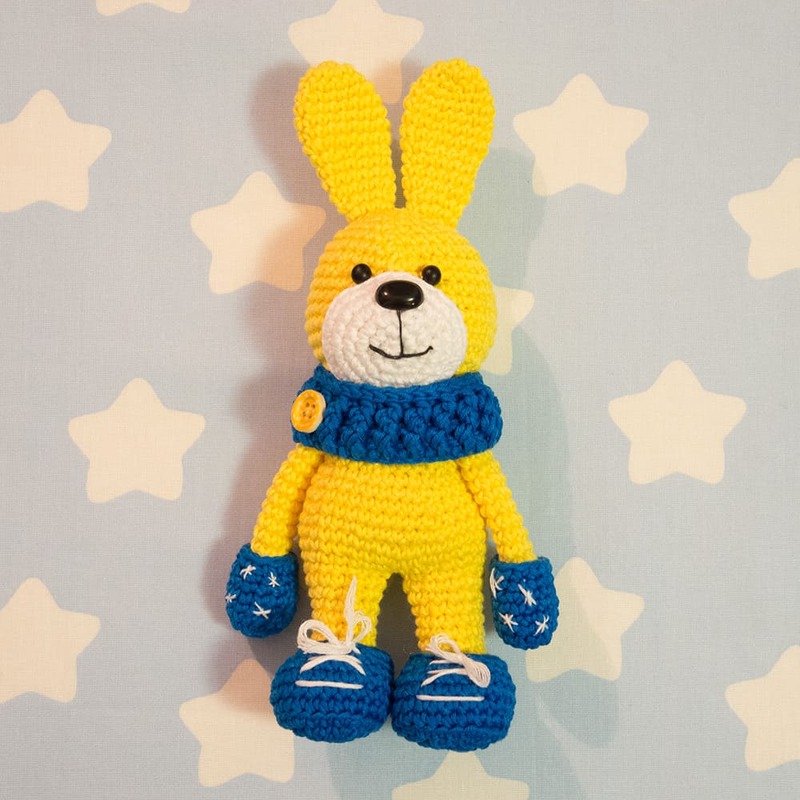 The second arm is crocheted in the same way. Fold in half, crochet sc through both layers of the last round. 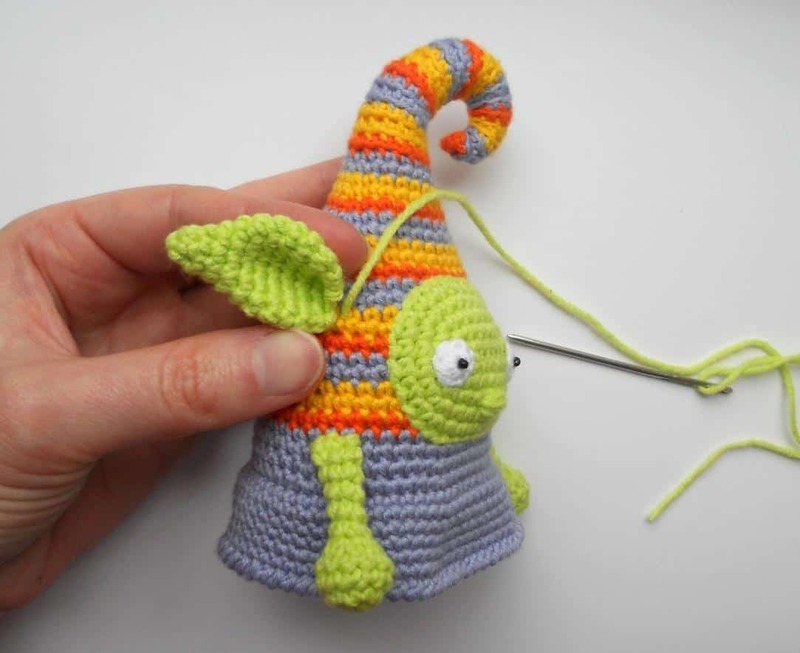 Before sewing you should fold the ear in half one more time to give the appropriate shape. Rnd 1: 8 ch, inc in the second st from the hook, sc in the next 5 st, 3 sc in the last ch, turn, sc in the next 6 ch. 6 sc in a magic ring, fasten off and cut the yarn. Sew a black bead in the centre of each eye. Sew eyes to the face with sewing thread. You can use safety eyes if you like. You have a long tail at the top of the cap. It’s a time to make the tip of the cap a bit twisted. It’s very easy. Insert the yarn in the needle and weave the needle at the side of the cap through the front loops till the Round 20. 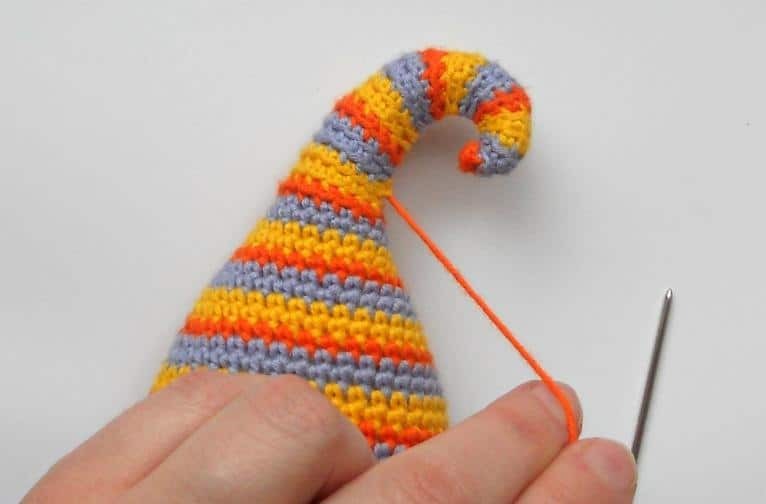 Draw the yarn and the cap will become twisted. Draw tightly to have a beautiful and straight twist. Tie a couple of knots to fix the yarn at the place where the twist ends. Hide the end inside the elf. 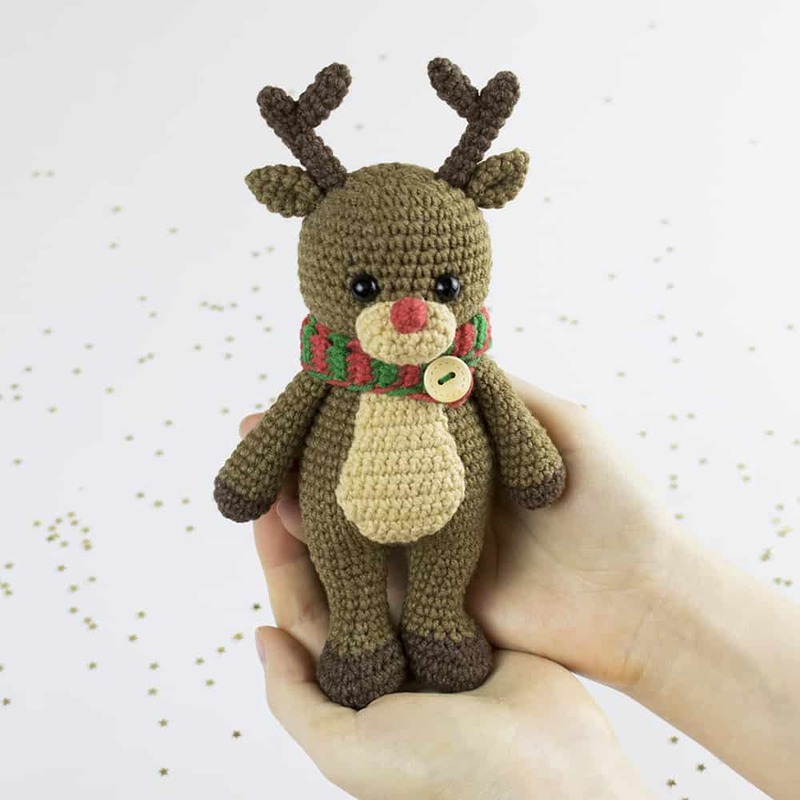 Sew the face to understand how to place the ears, legs and arms in a more beautiful way. Stuff the face a bit to make it more distinct. 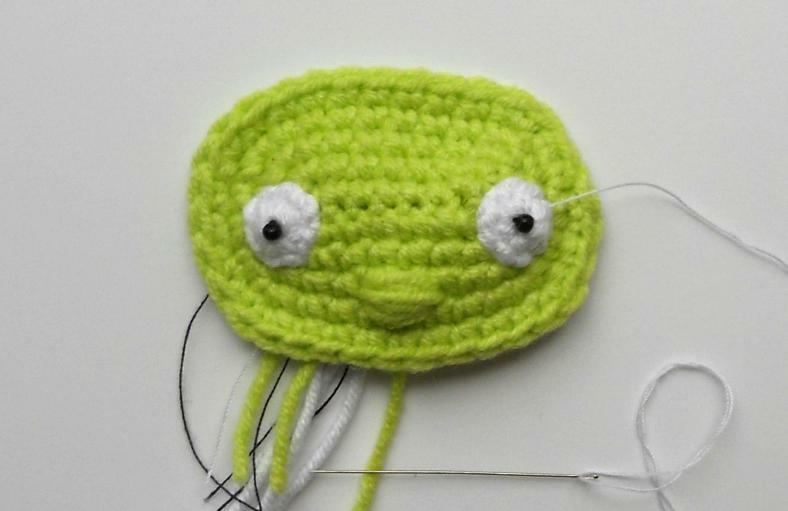 Sew the face with sewing thread, trying to do everything carefully. You may pin the face before sewing to fix it. The bottom edge of the face is one round down the bottom edge of the cap. Now let’s sew the hands. They should be just under the cap on the front side of the body. 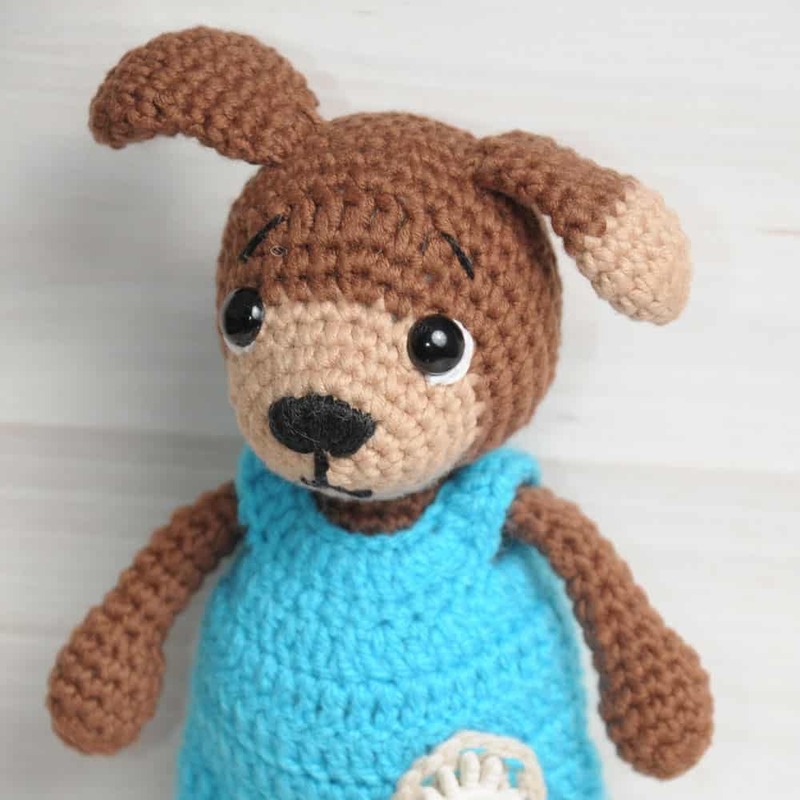 Fold the ears as it specified earlier and sew to the sides above the eyes. 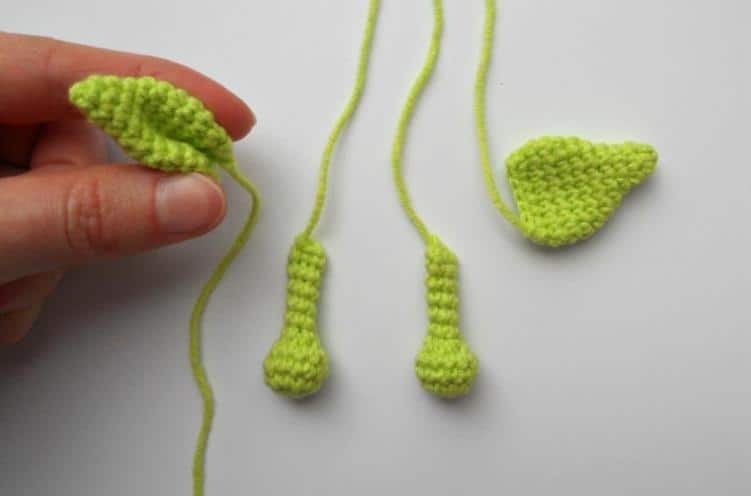 Sew the legs in the middle of the bottom part. Each leg should be on one line with the eyes. There is a line in the middle of the body, where we divided the round in two half-loops. I sew this line with beads to get a beautiful belt. You can use a beautiful ribbon and make a belt with it – it all depends on your imagination. You can attach a pendant on the belt or a couple of beautiful beads. It’s necessary to sew a small bell to the tip of the cap. If you don’t have a bell, just sew a beautiful bead. You can embroider legs with beads as well. Now we’re going to make a beautiful rope for hanging. 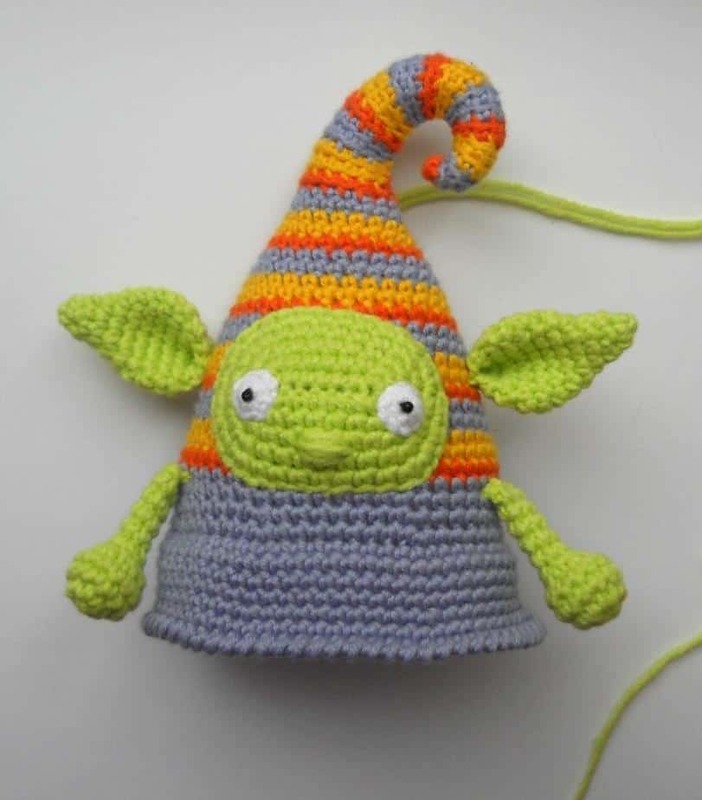 Insert 2 light-green tails from ears in the middle of the cap tip (the distance is 1 stitch from each other). 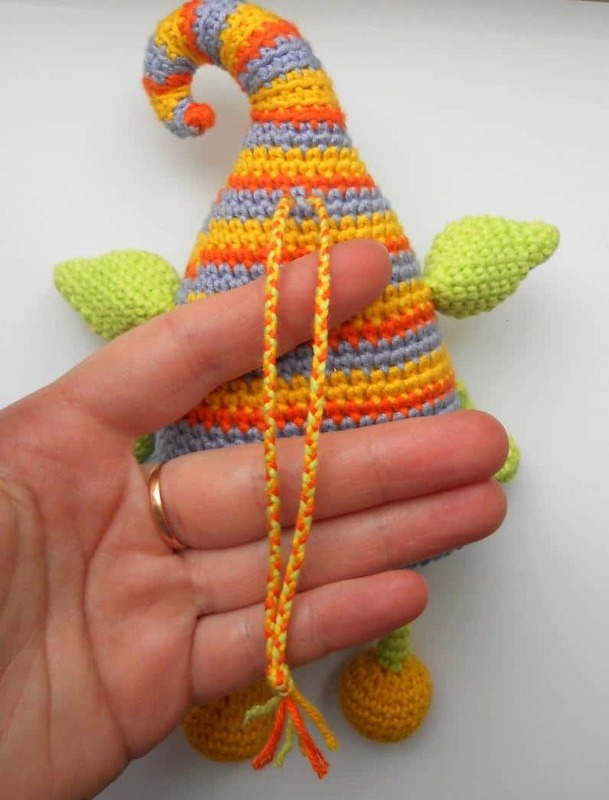 Add 2 other coloured strands, and you get 3 strands on each side of a single crochet. Weave two thing braids and tie them with a knot. You get a wonderful multi-coloured rope. I don’t understand how to make the face. Round 1 : chain 8 and then backwards but what about “turn and chain 6” ? How is it in the same round ? I made the elf over the past couple days. Had to make a different face because when I followed the pattern it ended up looking like ET. Darling little creature now. How are you supposed to obtain the pattern if you can’t copy it and no link is available to download it, if available?